Different frequencies to suit your needs, your applications, your sector. 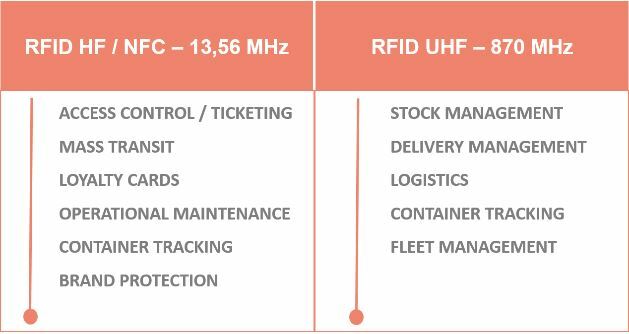 RFID UF or UHF? What's best? What are the standards? High Frequency (HF) electrical waves broadcast at 13.56 MHz on the radio frequency spectrum, whereas Ultra High Frequency (UHF) broadcasts at 860.960 Mhz. HF chips are best suited to applications that require the reading distance to be less than 1 meter. UHF chips, on the other hand, are better used in applications where the reading distance exceeds 1 meter, sometimes up to 15 meters - depending on the limitations of the reader. Paragon ID is the leading European manufacturer of RFID labels, and respects standards ISO 14443, ISO 15693 and ISO 18000.